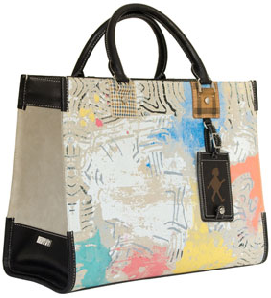 American Express and Vanity Fair have teamed up on this limited-edition luxury tote, dubbed Index of Happiness. Combining a mixed-media Baechler painting with Lambertson Truex elegance, the tote was unveiled at the Vanity Fair Campaign New York party to celebrate the best of culture, art, style & other fabulousness that VF has to offer. Only 200 totes were created & signed, and are available solely to Amex cardholders until October 31 at VFCampaignNY.com.